What is Google Chromecast? Which speakers and TVs are supported? | What Hi-Fi? Since launch, Google’s Chromecast tech has escaped its dongle-shaped hearth and spread like wildfire. These days it’s embedded in loads of apps and a whole bunch of tech products - only some of which are actually made by Google. While similar in practical terms to Apple AirPlay and plain old Bluetooth, Chromecast actually works differently to - and in some ways better than - both. So how is Chromecast different? How do you get it? And how do you use it? Buckle-up as we give you the full low-down. Put very simply, Chromecast is a technology that enables the sending of media files (and web pages, but we’ll get to that) from a handheld device to a TV screen or audio system. While the number of products with Chromecast built-in (literally called “Chromecast built-in” products) has blossomed, Google’s own Chromecast devices remain some of the best and most interesting, not least of all because they can be used to affordably add clever streaming features to TVs and sound systems that otherwise lack them. Those three Google Chromecast devices are the recently refreshed standard Chromecast, the 4K Chromecast Ultra, and the Chromecast Audio. Plug these into your TV, AV receiver or music system and they enable you to wirelessly stream video, pictures or audio from your smartphone or tablet. And it’s not just for those with Android phones and tablets. Unlike AirPlay, which only Apple products can use, Chromecast can be used by a smartphone or tablet with any OS. 'Chromecast built-in' is what Google calls the same streaming abilities integrated into a product such as a TV or speaker. So if a TV comes with Chromecast built-in, it's ready to receive content sent by a phone or tablet without the need of a dongle. Chromecast built-in used to be called Google Cast (and still is, in some instances). If a product refers to its ability to 'cast' content, it means streaming it to a Chromecast-equipped or Chromecast built-in device. The app used to set up and manage this streaming is called Google Home (which is separate from the voice-controlled speaker of the same name). This could all be simplified, we're sure you'll agree. The reason for all this inconsistency? Progress, mostly, and Google's piecemeal approach. Google first launched the Chromecast dongle with only a small number of compatible apps. But since 2014 it's made the software available to all developers and manufacturers, allowing Chromecast built-in to be added to any product. Along the way, the many name changes have caused industry onlookers to scratch their heads. Thankfully, you can identify any product with Chromecast built-in by looking for the logo. At least that part is simple enough. How do you stream to a Chromecast device? It’s pretty simple to stream content to any Chromecast device, whether that’s one of Google’s own or one with Chromecast built-in. First, make sure you have the Google Home app downloaded on your smart device, which you'll need to set up the 'cast' function. Then connect your smartphone or tablet to the same Wi-Fi network as your TV, open up a Chromecast built-in-enabled app such as YouTube, Now TV, Netflix or Spotify and press the 'cast' button from within the app - it’s usually at the top right of the screen, and looks like a wi-fi symbol inside a rectangle. You can even ‘cast’ tabs from the Chrome web browser on PC or Mac, which is less fun but can be useful for work meetings and the like - you’ll find the option in Chrome’s settings menu. And that’s it! Your content will be beamed to the big screen or music system, and you can control playback via your mobile device in the best quality your broadband connection can muster. Happy days. The big difference between ‘casting’ in this way and using Bluetooth or AirPlay (or AirPlay 2, for that matter) is that the ‘casted’ content is not coming from your handheld device but directly from the internet. Your phone or tablet is acting more like a fancy remote control, pointing your TV or speaker to what you want to watch or listen to. The advantages to this approach are numerous: quality is generally better thanks to the higher quality and more direct data transmission, there’s much less strain on your mobile device’s battery, any notifications or calls you receive won’t interfere with whatever is being streamed, and the video or audio won’t immediately stop if you move out of range of the Chromecast device that’s receiving it. It’s similar to how Spotify Connect works, but it’s obviously not restricted to use with just the one app. So what can you stream using Google Chromecast? Big name audio apps, including Spotify, Tidal, Deezer, Amazon Music (on Android-only) and of course Google Play Music are all supported, as is Plex (for streaming locally stored music collections). One notable omission from the list of supported apps is Apple Music. Google says it wants the music streaming service to jump on board but, predictably, Apple isn’t playing ball. As for video, Netflix, Now TV, BBC iPlayer, ITV Hub, All 4, My5, Google Play Movies and YouTube are all present. The big absence here is Amazon Video. You can see a full list of compatible Google Chromecast built-in apps for both TVs and speakers here. Which Google Chromecast built-in TVs are available? Chromecast is a feature of all TVs that run the Android TV operating system. That includes most Sony and Philips TVs from 2017 and 2018, plus many from the likes of Sharp, Toshiba, Polaroid and Vizio (in the US). Highlights include the Award-winning Sony KD-49XF9005 and it’s 65in sibling, the KD-65XF9005, plus Philips’ new OLEDs, the 55OLED803 and 65OLED803. Google’s main entries into Chromecast built-in speakers are its own Google Home, Home Mini and Home Max. 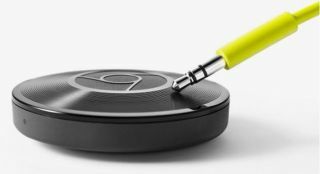 You can stream music from your phone to the one of these using Chromecast-compatible apps, or even use the Home speakers themselves to ‘cast’ content to other Chromecast devices using Google Assistant. You’ll also find Chromecast built-in in products from other manufacturers, such as Sony, B&O, Harman Kardon, JBL, LG, Onkyo, Philips, Sony, NAD and Naim. And we’re not just talking wireless speakers here: Sony’s multi Award-winning home cinema amp, the STR-DN1080, has Chromecast built-in, as do Naim’s awesome Uniti Atom, Nova and Star streaming systems. You can find the full list of TVs, speakers and more with Chromecast built-in here.